Dr. John Lore served as a foundation intern to the CEO of one of the largest private foundations in the world, the W.K. Kellogg Foundation. He led the development of the largest nonprofit hospital system in the world, Ascension Health. He served as chair of his national professional organization, the Association of Fundraising Professionals, and led a statewide public-private fundraising effort securing $20 million of endowment gifts to support volunteering in Michigan forever. 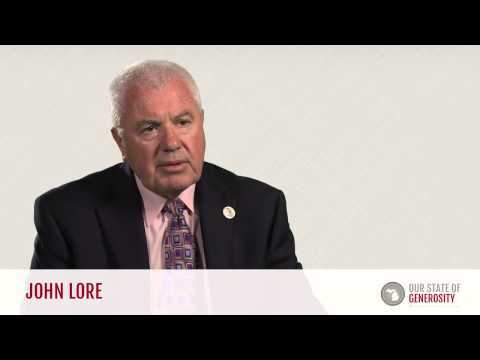 Throughout his career, Dr. Lore has been a highly experienced and valued member of the philanthropic leadership group working in the state of Michigan. He has watched the development of Michigan from several vantage points, and actively participated in some of the major efforts to secure philanthropy in Michigan. 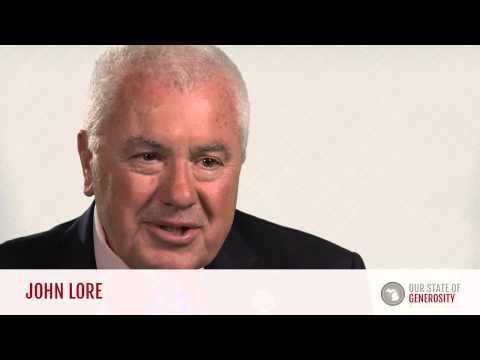 Dr. John Lore talks about his career in philanthropy. 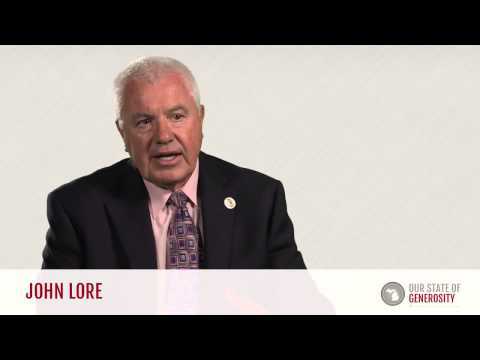 Dr. John Lore talks about the differing leadership styles of Russ Mawby and Dottie Johnson. Dr. John Lore talks about the incredible leadership of Russ Mawby and Dottie Johnson. 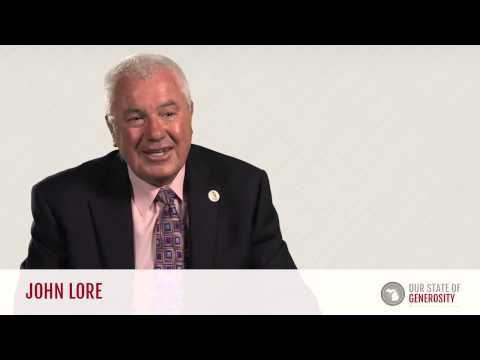 Dr. John Lore talks about Michigan's culture of servant leadership. Dr. John Lore talks about the founding of the Council of Michigan Foundations (CMF). Dr. John Lore talks about the founding of the ConnectMichigan Alliance (CMA). Dr. John Lore talks about the challenges in starting the ConnectMichigan Alliance (CMA), as well as the successes achieved by the project. Dr. John Lore talk about how necessary it is to be fearless in nonprofit work and to "be sensitive enough to be angry." 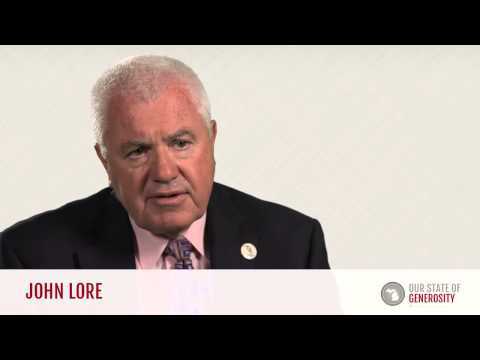 Dr. John Lore talks about the importance of expanding to a broader definition of philanthropy. Dr. John Lore talks about the importance of preserving the stories of Michigan's philanthropic leaders. Dr. John Lore talks about the founding of the Michigan Nonprofit Association (MNA). Dr. John Lore provides an anecdote about the founding of the Michigan Community Service Commission (MCSC). Dr. John Lore talks about establishing national codes of conduct for fundraising organizations. Dr. John Lore completed his Bachelor of Science in printing management and finance at Western Michigan University (WMU) in 1965. He received his Master of Arts in leadership from WMU in 1967, and his Doctorate in Education in foundation leadership from WMU in 1974. He wrote his doctoral dissertation on the impacts of the Tax Reform Act of 1969 on private foundations. The Tax Reform Act of 1969 was one of the defining public policy initiatives affecting philanthropic organizations in the United States. 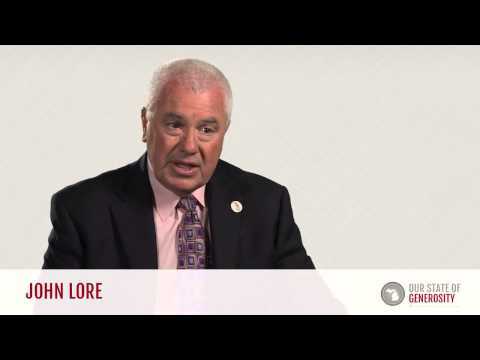 Dr. Lore’s understanding of the causes of, and consequences from, this federal regulatory legislation has informed his career as a practitioner-scholar of the field. Dr. Lore’s first introduction to the importance of serving others came as a young child, when his own family received food supplies from the local Goodfellows nonprofit organization. As a W.K. Kellogg Foundation intern in 1973, Dr. Lore worked closely under CEO Russell Mawby’s direction. During this time, Dr. Lore was introduced to the many facets of Michigan philanthropy and needs of foundations after the Tax Reform Act of 1969. This internship helped Dr. Lore transition from an observer to an active participant in Michigan’s philanthropic sector. After that, Dr. Lore cited his time working with the Sisters of St. Joseph as “the most definitive part” of his life and philanthropic journey. As executive vice president (and later president and CEO) of the Sisters of St. Joseph Health System, he worked closely with the sisters and was impressed by the way they enacted their core value of servant leadership. This would be a concept Dr. Lore would carry with him throughout his career. 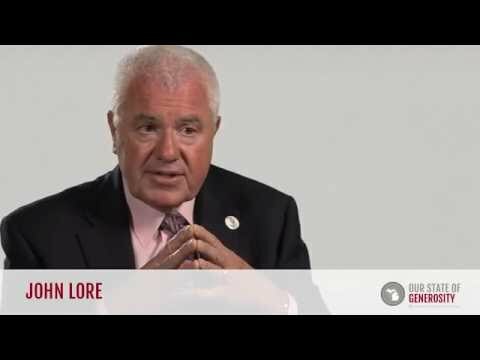 Dr. Lore was recruited by Dr. Russ Mawby to lead fundraising for what would become the ConnectMichigan Alliance [CMA]. This movement was in response to a growing concern that Michigan’s nonprofit sector would struggle without a robust network of volunteers and an infrastructure with which to manage it. Many key leaders realized that such a network’s success would be greatly dependent on consistent public and private funding, which was uncertain at the time. This uncertainty was compounded by the impending conclusion of Governor Engler’s administration, and so a campaign was started to create a permanent endowment to promote and strengthen a lifelong ethic of service and civic engagement throughout the state of Michigan. This initiative sought to build and strengthen Michigan communities by supporting existing nonprofits through promotion of volunteerism, advocacy and public policy, training and technical assistance, and direct programming. By housing all statewide volunteer and service-learning initiatives under one administration, CMA aimed to increase capacity and effectiveness while decreasing overall administrative cost and burden of supporting nonprofits. Governor Engler championed the creation of a $10 million 1-for-1 challenge grant by the State of Michigan, which was matched by funding from the nonprofit sector (private, family, and community foundations), the for-profit sector (corporations and sole proprietorships), and individuals. Dr. Lore, along with the founding leadership team*, worked tirelessly to help raise funds for the matching grant. It was a truly unusual effort, fundraising for an organization that was not yet in existence. Dr. Lore’s leadership, along with the stature and experience he recruited to the fund-raising team, resulted in the unprecedented, perpetually endowed $20 million public-private partnership to assure that voluntary efforts would continue in Michigan. An innovative and collaborative initiative, it was achieved through sector-wide collaborative selflessness, including the decisions of the Michigan Nonprofit Association and the Michigan Community Service Commission to move both programs and endowments to the developing organization. Dr. Lore was asked to serve as president and CEO of the ConnectMichigan Alliance after its creation in 2001. In addition to the endowment he had helped raise, CMA housed many initiatives that focused on supporting volunteerism, including the Volunteer Centers of Michigan, Michigan Campus Compact, and America’s Promise, which were previously supported by MNA. 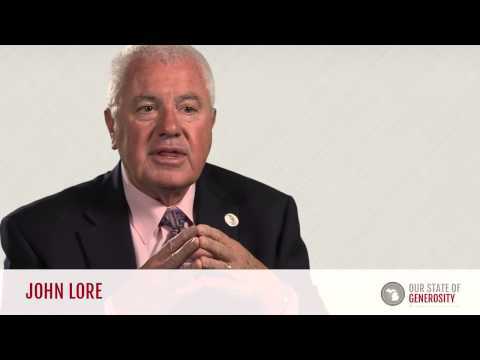 In 2004 Dr. Lore stepped down from his leadership role at CMA. 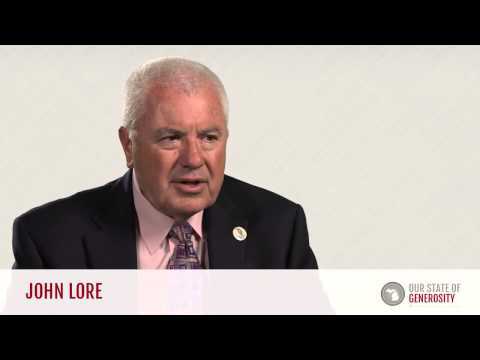 Prior to his involvement with CMA, Dr. Lore worked extensively within Michigan’s institutions of higher education. He served as director of alumni and development at Western Michigan University from 1966 to 1972. He also worked as president of Nazareth College in Kalamazoo (now closed) from 1972 to 1980, and president of the Michigan Colleges Foundation (now called the Michigan Colleges Alliance) from 1980 to 1986. 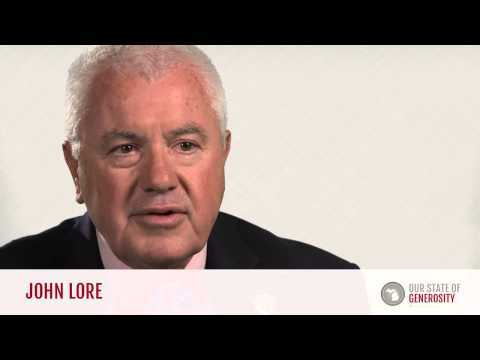 Dr. Lore served as president/CEO of Ascension Health from 1986 to 2000. During this time, he oversaw the merger of the Daughters of Charity National Health System and the Sisters of St. Joseph Health System to form the largest nonprofit health care system in the world. At his retirement in 2000, the system included 120,000 employees and roughly 100 hospitals in 36 states. Additionally, Dr. Lore served on multiple boards including Learning to Give and the Nonprofit Council (a precursor to the Michigan Nonprofit Association) during the early years of their development. He also served as chair for the Association of Fundraising Professionals (AFP) in Washington D.C. from 1993 to 1994. Dr. Lore was a driving force in increasing the professionalism of the fundraising field by advocating the need for mentoring throughout his time at AFP. *Comprising the founding leadership team were Dr. Lore and the CMA campaign co-chairs: Michelle Engler, Michigan First Lady, Julie Fisher Cummings of the Max and Marjorie Fisher Foundation, and William C. Richardson who was CEO of the W. K. Kellogg Foundation. 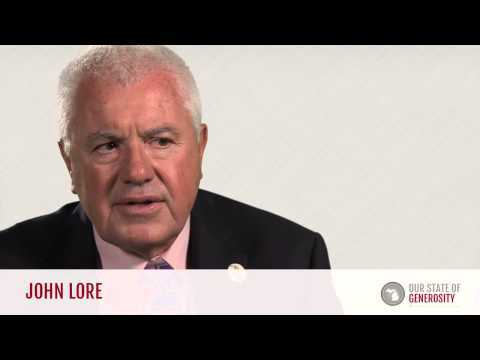 Dr. Lore was interviewed regarding his insights and experiences in working with Michigan’s philanthropic community and the Our State of Generosity (OSoG) partners. The following are selected quotations from his interview specifically related to the five organizing themes of the OSoG project.